I do not get to Clare Valley very often (about 4 times in the last 20 years) but I have made it to Jim Barry wines a number of times. Yet again this iconic winery did not disappoint. With their new winemaker coming from McLaren Vale we were able to get a tour of the winery – I will elaborate on the tour in Part 2 of this review. The Lodge Hill Vineyard on the eastern side of the town of Clare. Has consistently produced Riesling and Shiraz wines of substance. One vineyard and 2 soil types – just so suited to the Riesling and Shiraz grape. The Florita Vineyard has long been considered one of the premium vineyards in Australia – John Vickory from Leo Buring made the famous Rieslings in the 50’s and 60’s from this Watervale vineyard. Jam Barry bought the vineyard in the 80’s when many vineyards were being ripped up in the government led vine pull scheme. The Armagh vineyard at the North of the township of Clare and was planted by Jim Barry in 1968 with Shiraz. These low yielding vines produce highly concentrated fruit. There is a Coonawarra connection here with a vineyard near Penola that was at one time a cricket ground. Jim Barry decided to not only keep the cricket theme in the vineyard (by keeping the grandstand but also the cricket pitch has not been planted), but the wines also have a cricket theme. Very smart marketing play that is used in the mid range wines and the high end Cabernet. Now for my review of the sparkling and white wines. You will need to check out Part 2 of this review for the red wines. A yeasty aroma combined with cherry and strawberry flavors wrapped up in a nice crisp acidity that is like a freshly picked Granny Smith Apples. Not a classical “Champagne” style, but this cellar door only wine is more than just a sense of fun. I would consider this a drink now and enjoy as an aperitif wine. This yet to be released wine is a beauty and all that you would expect. The citrus and the minerality were here in spades. What I was not expecting was the layer of floral notes that added considerable complexity. Love it – aromas of grapefruit and it’s zest rubbed all over some of the finest slate. The flavors are similar with the added acid of limes and lemons. Drink it now or drink it any time in the next 10 years and I am sure it will be good. So different again – and my favorite of the 3 vintages. Here the kerosine kicks in with that grapefruit zest aroma and then the kerosine developed flavor with lemon, lime and this time mandarins as well. If this does not want one to throw away the Sauvy then, well maybe there is no hope. A 70% Sauvignon Blanc and 30% Semillon blend that starts with aromas of grass, honey dew melon and passionfruit. The passionfruit continues with the flavors and quite an interesting acid length. Not a bad wine, but after the Rieslings I can not see why you would. Each year the winemakers trial different wine styles and sell them at the cellar door to work out what the wine public like. The 2009 project was a Germanic Riesling – low alcohol and higher acid. This was all about green apples, grapefruit, lemon and limes with that slatey tang. Not as sweet as I expected and that was a good thing. A classy wine that I am told is “walking out of the cellar door”. We may see more of this wine style from Jim Barry Wines. 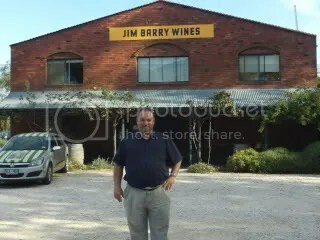 This entry was posted in wine and tagged Clare Valley, Glossary of wine terms, Jim Barry Wines, Leo Buring, Mclaren Vale, Riesling, Sauvignon Blanc, semillon, wine, Wine tasting descriptors. Bookmark the permalink.